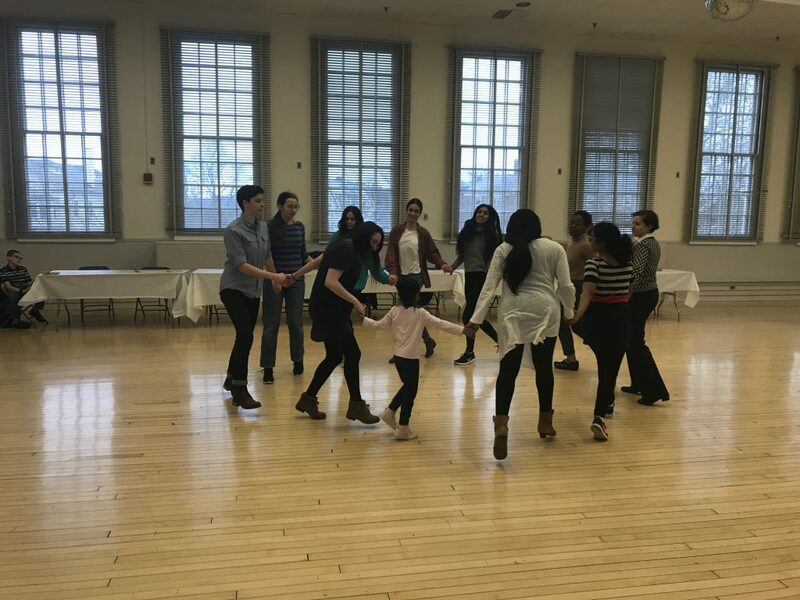 On Tuesday, April 17th, over 40 students, faculty, and staff gathered in Davis Ballroom for an end of the semester Arabic program party. 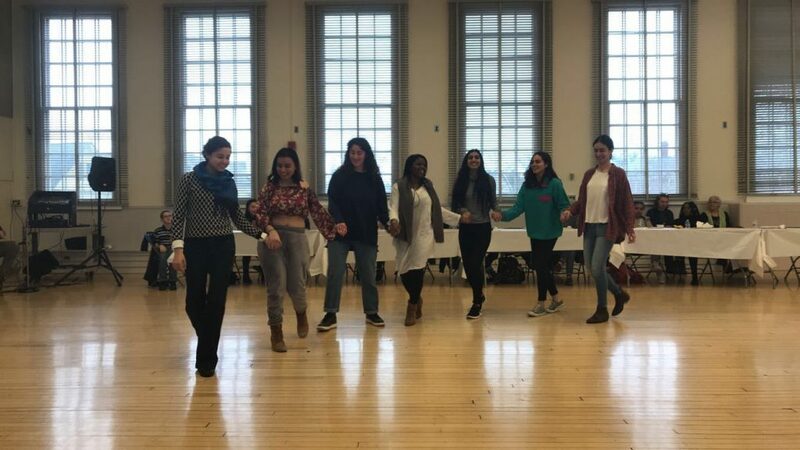 The event was organized by May George (Lecturer, Middle East Studies) and featured food from Taste of Lebanon Restaurant and live music while participants learned the Dabka, a traditional Lebanese dance. Attendees viewed video projects created by students using WeVideo, a collaborative cloud-based video editing software. These presentations documented the students’ experience ordering food in Arabic with native speakers, as well as reflections on the Middle Eastern food they tried. 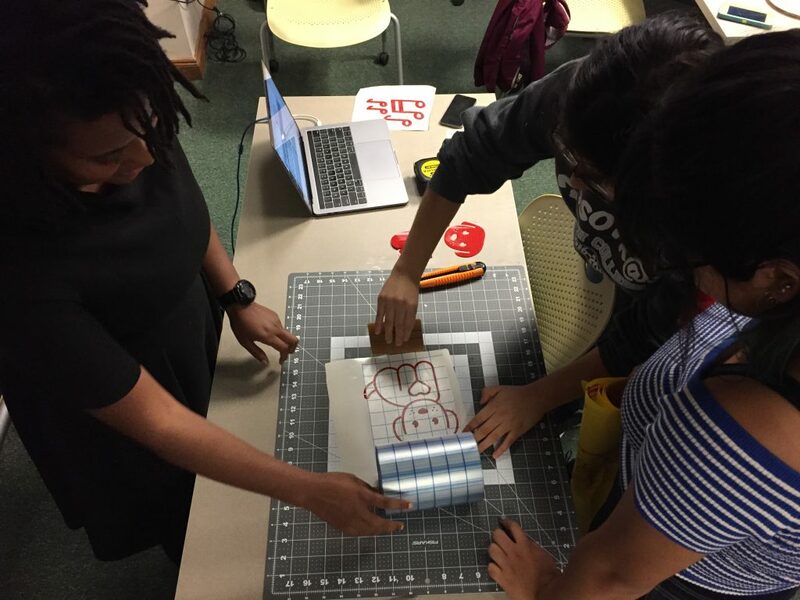 This event was funded by a KnowledgeLab mini-grant, which are available to support experiments in technology, services, and programming for the New Neilson library. 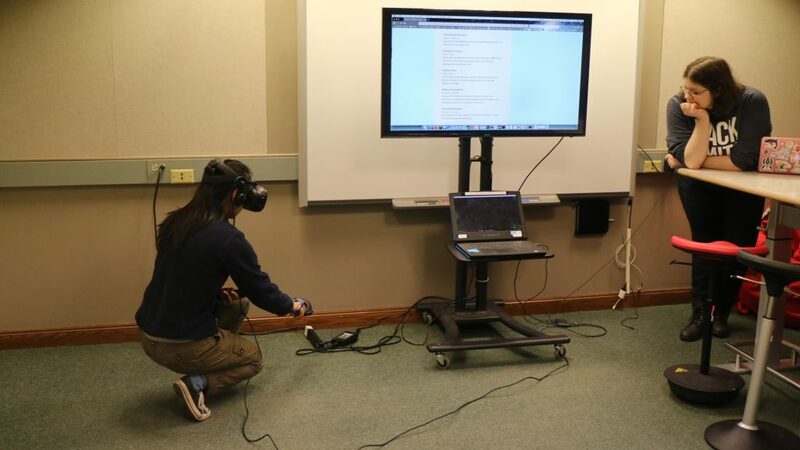 While Neilson is closed and there currently isn’t a natural space on campus for events that present and celebrate student digital scholarship, KnowledgeLab mini-grants allow us to pilot and experiment in collaboration with students and faculty. 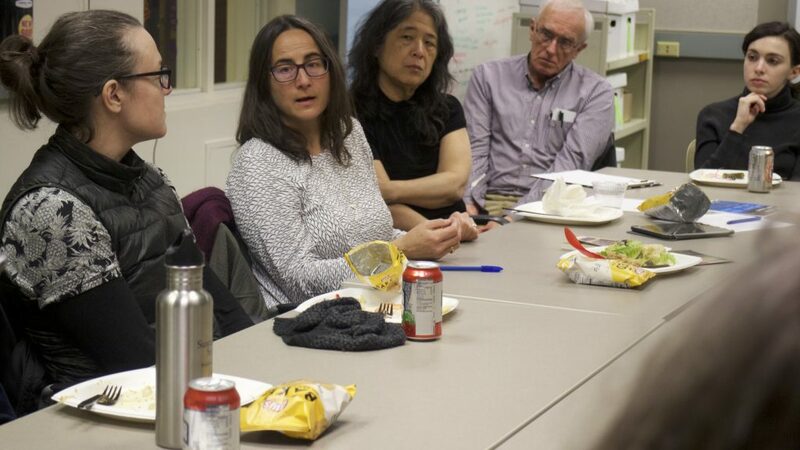 Events like this allow us to build new partnerships while learning what sorts of spaces, physical, mental, and technological, we need to design for the New Neilson Library. Keep an eye out for more KnowledgeLab-sponsored events in the future! 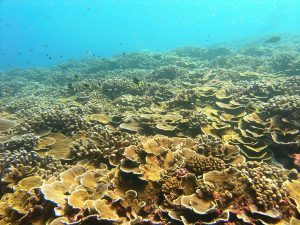 Coral reef, Jarvis Island. NOAA Photo by Bernardo Vargas-Ángel. How can virtual and immersive experiences help us face the realities of climate change? 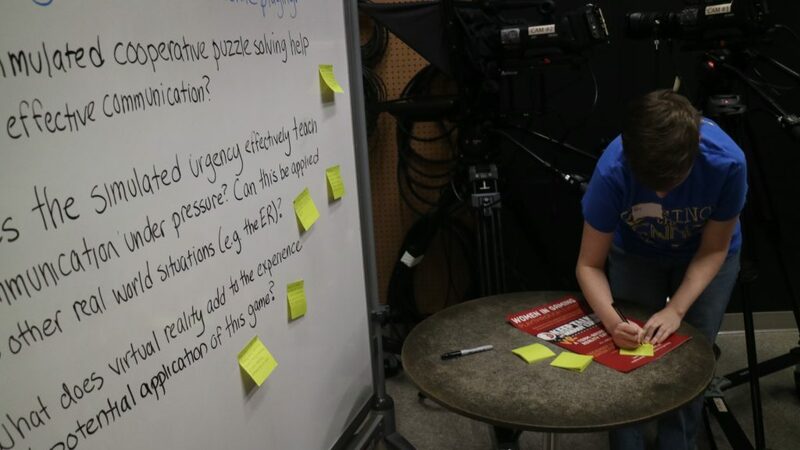 The Knowledgelab and Smith College Libraries will explore this and other questions on Friday April 20, 2018 with our Talking Truth @ Smith event, a series of workshops and reflective gaming and making activities from 10am – 4pm. 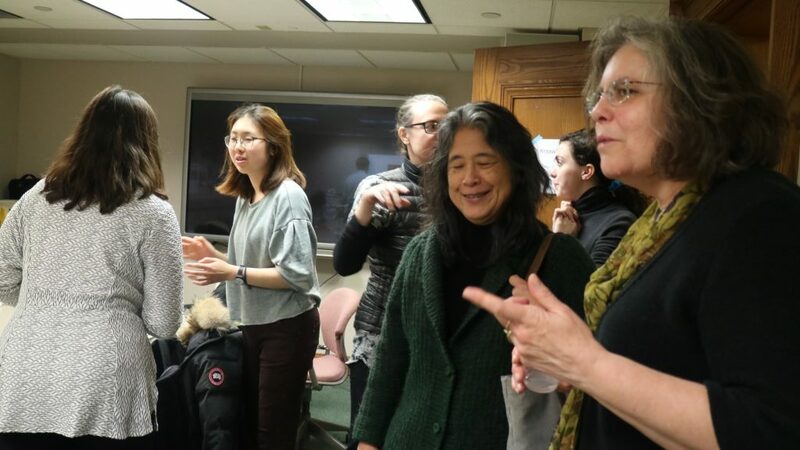 The Talking Truth series began at UMass Amherst as an effort by librarians, students, activists, and others to engage communities in dialogue about the impact of our changing environment on our emotional and physical well-being. All events held in KnowledgeLab, Seelye B4. Come to the KnowledgeLab to witness ocean acidification firsthand in a short virtual reality experience. UMass Librarian Madeleine Charney will lead a discussion about using her career to build a more sustainable world. Lunch provided; vegan/gluten-free options served. 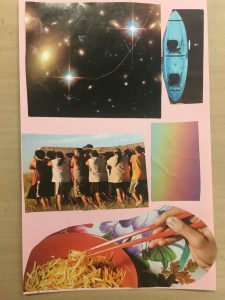 Hands on writing and discussion workshop about the significance of identity and place in a climate chang(ed) world, led by Outreach Librarian Jodi Shaw. 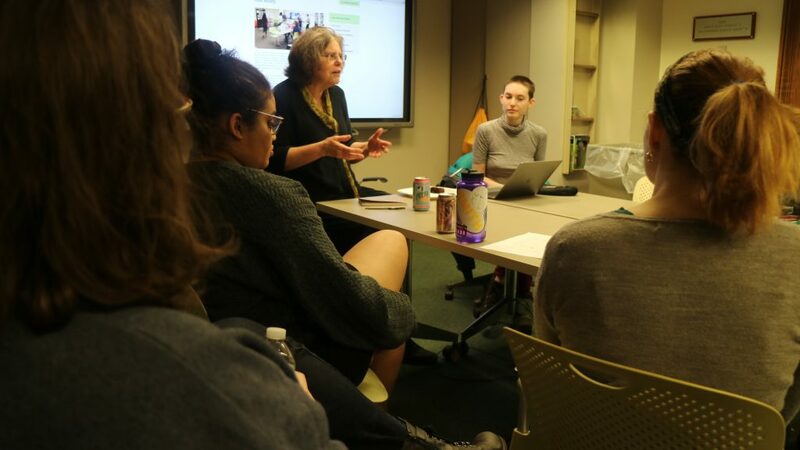 Discussion: How does the new Neilson library facilitate future conversations, making, and scholarship about Climate Change? Janet Spongberg, Josten Library Circulation Coordinator. 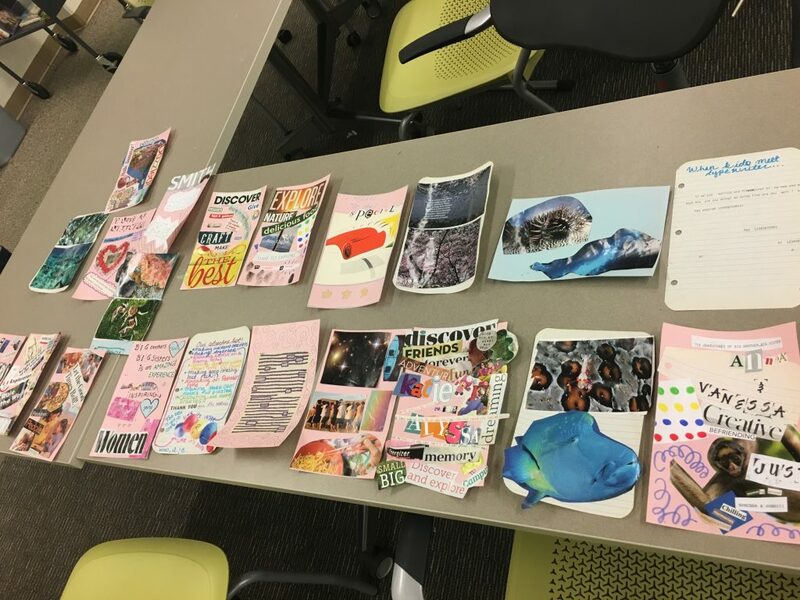 Zine workshop: “An Open Letter to the Smithies of the Future.” Led by Amanda Ferrara, Archives Associate. 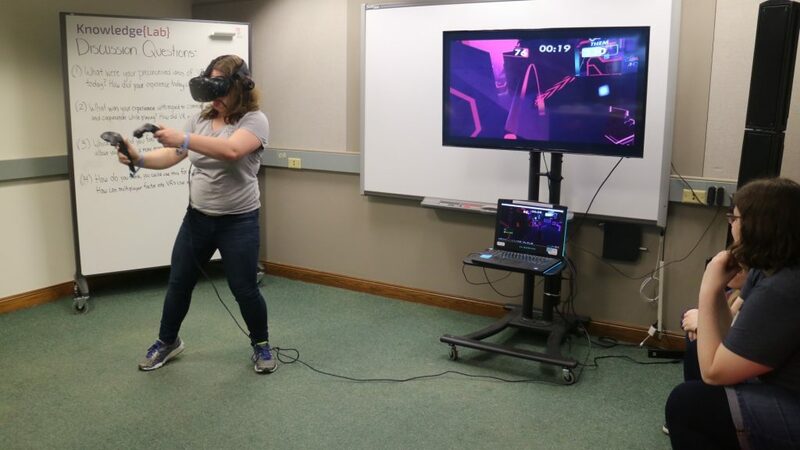 On Friday, March 30th, the KnowledgeLab hosted the first ever gaming event to take place at three locations across campus where students could compete against each other in virtual reality. Attendees played Rec Room, a multiplayer mini-game collection where each person played laser tag and disc golf in games against other real players in different Smith locations. We also played Star Trek: Bridge Crew, an action-adventure game that places you right into the Starfleet ship. 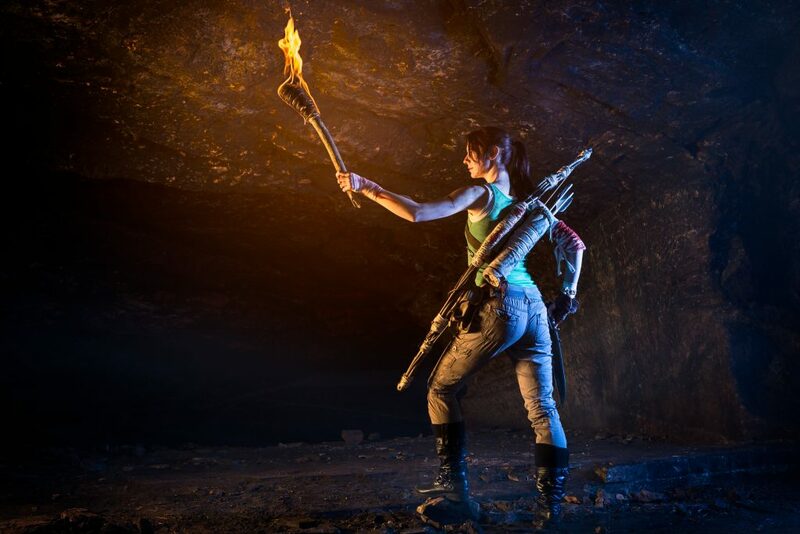 Both games provided fully immersive atmospheres where the players could experience the world of the game from the perspectives of their avatars and could move around freely and explore the virtual space. 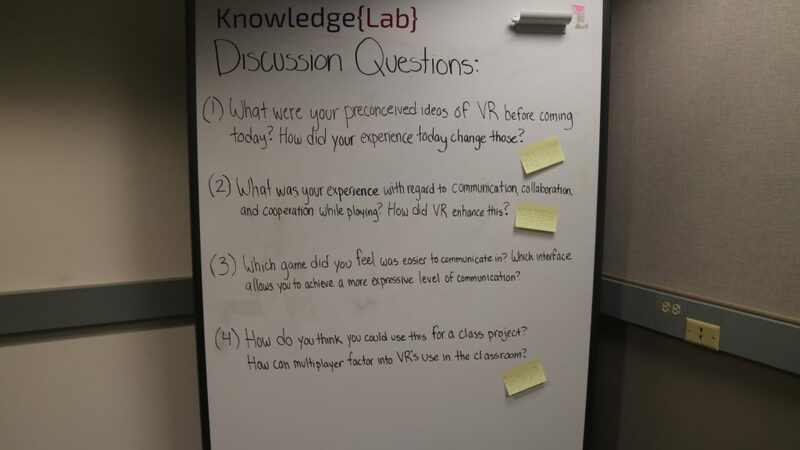 Those who joined us in the KnowledgeLab really enjoyed the experience and the spectators had just as much fun watching them play and interact with virtual opponents and teammates. 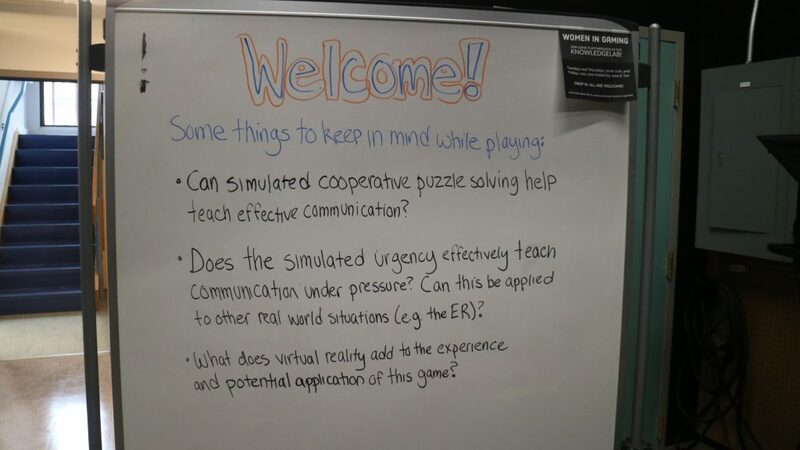 GAP presented several discussion questions for the gamers to think about as they played. 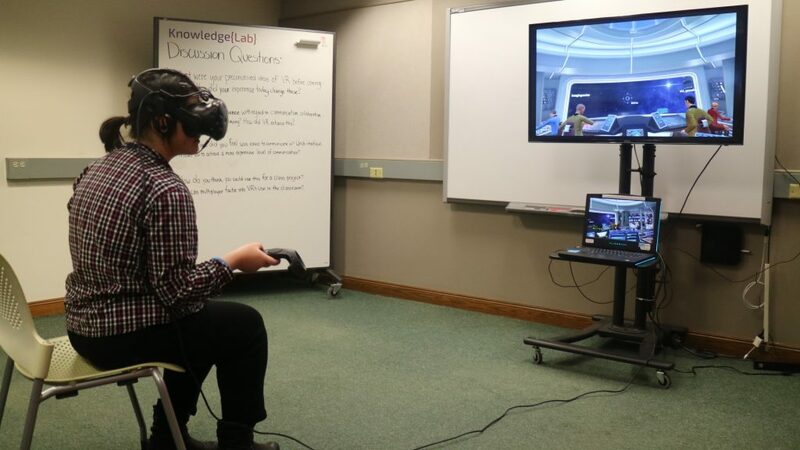 We didn’t have very much time to play Star Trek: Bridge Crew at our event, but a student did get to briefly sit inside the ship and work the controls. The player’s avatar is seated in this game and we found that it was disorienting for the player if they were not seated in real life as well. 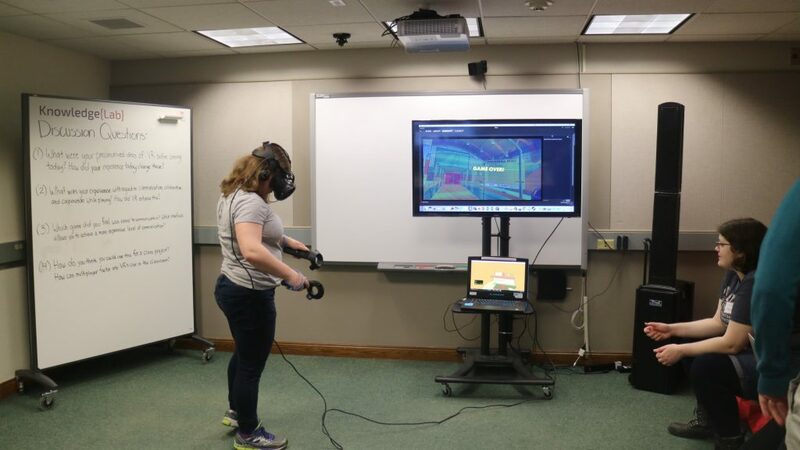 The KnowledgeLab Vive is open for student use during Joce Kofke’s hours – Tuesday/Thursday 12-2pm and Friday 1-3pm – or by appointment by emailing jkofke@smith.edu. 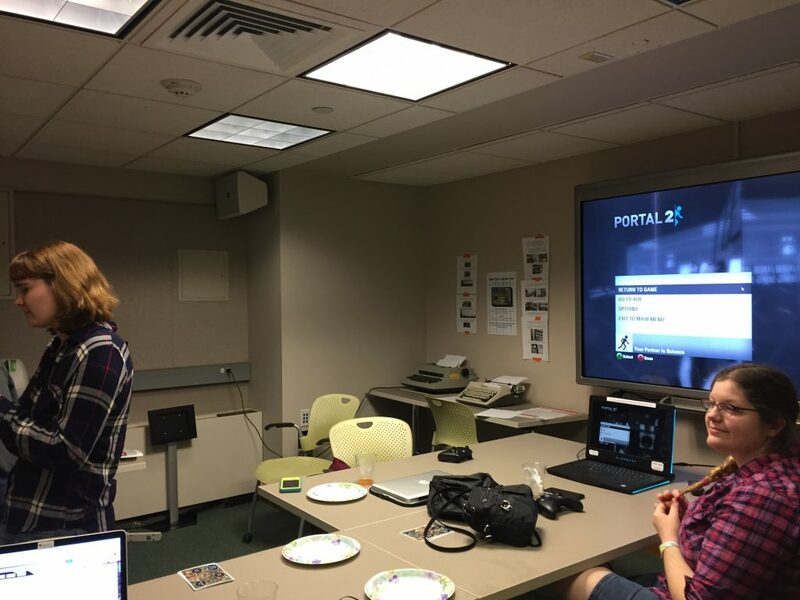 On Friday, February 9th, GAP (the Gaming Archives Project) had its first playthrough event of the semester. We played Gone Home, a single player walking simulator game, all the way through from start to finish. Gone Home is told through the perspective of Katie, who just got back from being abroad and comes home to a deserted house, her family nowhere to be found. Set in the 90’s, before cellphones, Katie must search around the house for clues and read letters from her sister to find out where they are and what happened while she was gone. Only one controller was in use during our playthrough as it is a single player game, but our player often read the notes and messages aloud for the entire room as Katie picked them up, and took input from others on where in the house we wanted to explore. Though only one person had the controls, it felt like a collective interactive experience, a bit like watching a film unfold in front of you, but having agency in what and how things happen. After finishing the game, there was a brief discussion about our thoughts on the design and the narrative. We talked about how the setting leads us to believe it is a horror game since it is set in an enormous mansion during a thunderstorm, and we have to turn on the lights as we enter each new dark and spooky room. For this reason, it was fun to play in a group rather than alone. We also compared it to What Remains of Edith Finch, a similar game that has more interactive minigames as the player advances through the narrative. Some people liked this better than Gone Home, which is strictly narrative without any flashback to the past or cut to the the events Katie’s sister describes in her letters. There will be a playthrough every other Friday in the KnowledgeLab and everyone is welcome to join us in playing or watching. 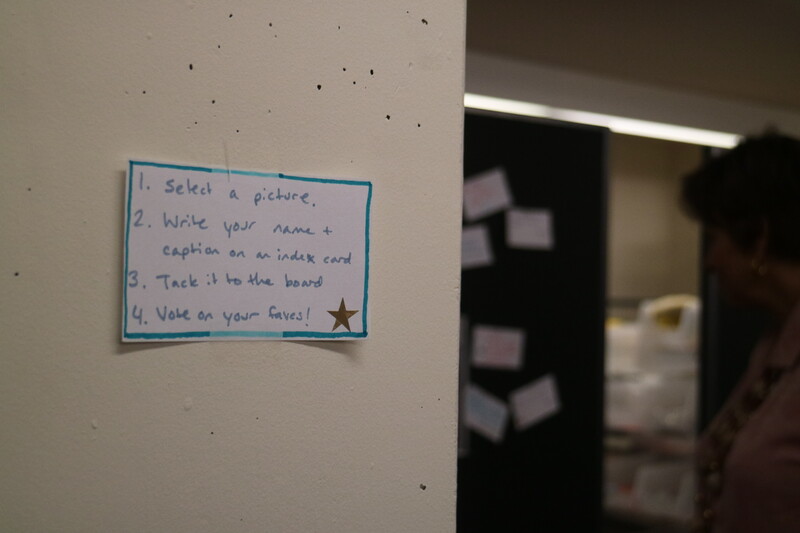 If you have a suggestion of a game for the next playthrough or to play on your own, email Joce at jkofke@smith.edu. 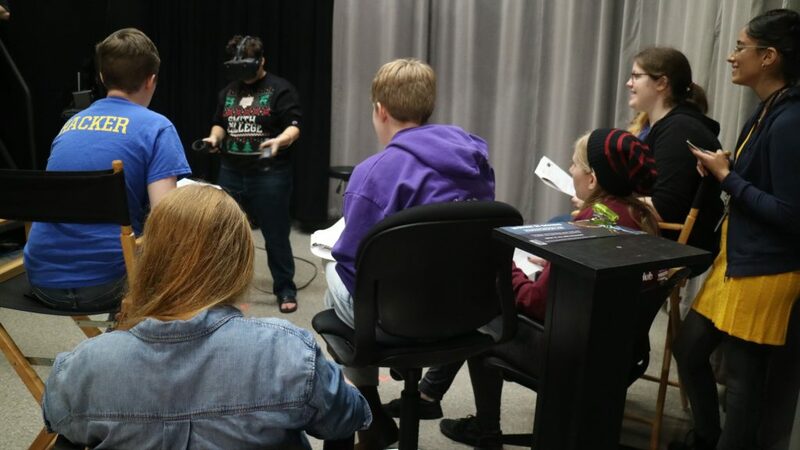 The gaming laptop is free to use whenever the KnowledgeLab is open, and new VR games can be played during Joce’s hours there: Tuesdays and Thursdays after 12:00pm and Fridays after 1:00pm. 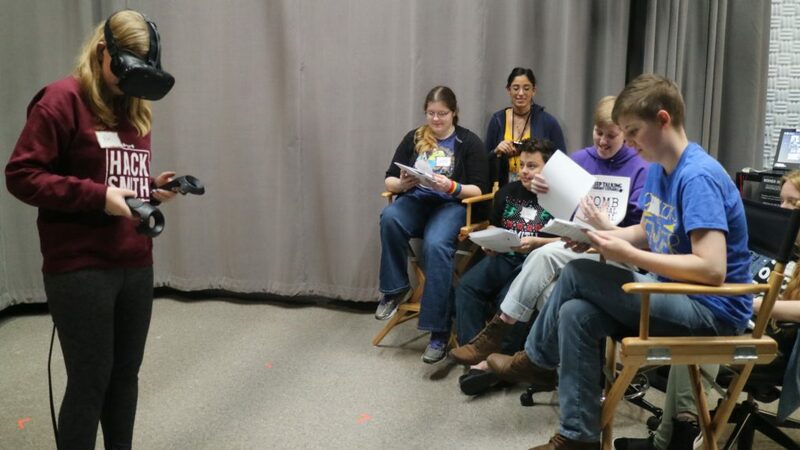 Last Friday, WIG hosted a Playthrough event in the CMP featuring the game Keep Talking and Nobody Explodes. This game was played on the Vive, a virtual reality system which allowed one player to become immersed in a room with a bomb where they must describe what they see in order to diffuse it before time runs out. Everyone else has the bomb’s instructions and must teach the player how to diffuse it without being able to see what is happening. 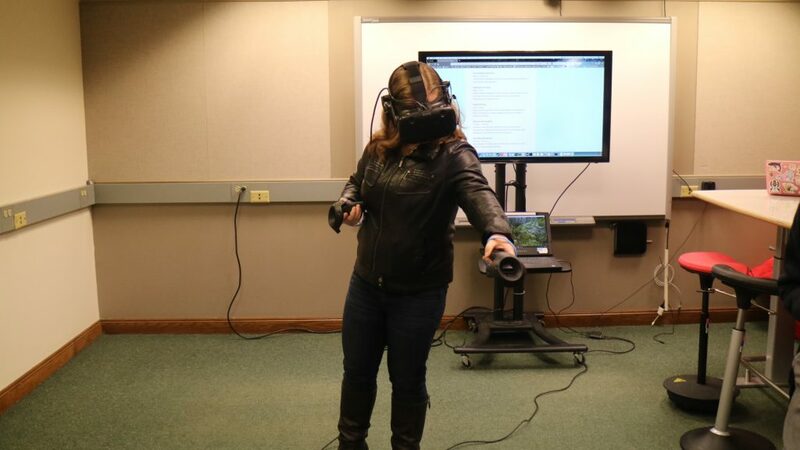 Every student who attended this event got a turn with the Vive to try to defuse the bomb. Overall, students effectively communicated and were able to stop the bomb from blowing up, but on a few more difficult levels, they were unsuccessful. It was especially hard when memory was required on both parts – sometimes the bomb diffuser would have to remember a sequence of colors or numbers, and the instructors would have to remember both the diffuser’s sequence in addition to another sequence that corresponded with it. These portions, in particular, caused several bombs to explode. 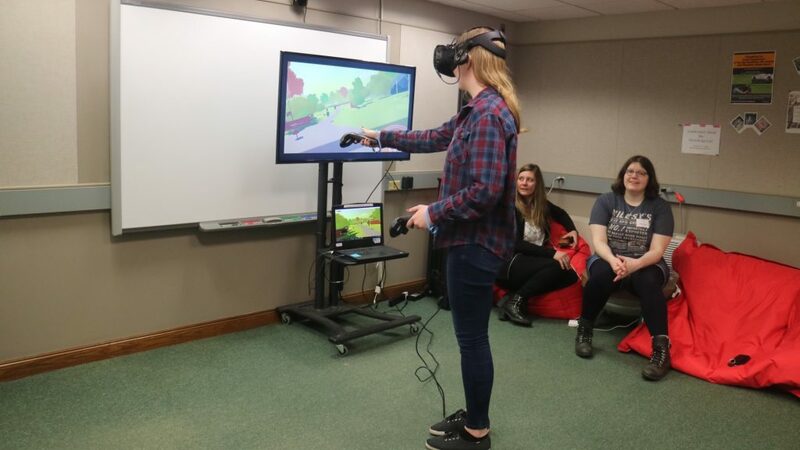 Students also had the chance to share their input on virtual reality games like this one and how they might be applied to life outside of the video game setting. This event had high attendance and was a great use of the CMP space and equipment. To book this space, simply contact Dan Bennett, CMP Media Producer, at dbennett@smith.edu. You can also join Joce and Tori in the KnowledgeLab on Tuesdays 12-2 and Thursdays 2-5 for their gaming open hours. This is just the first of several playthrough events WIG plans to host this year with a variety of games. Ellie Danford, club president of the Smith Gaming Club, voiced interest in collaborating with WIG next semester, as well. Thursday, October 12th was Here’s my Library Day at all the Smith Libraries across campus. The KnowledgeLab was one of the hosting locations of this event and provided refreshments and activities as well as all the resources already offered. Students learned how to make stickers with our vinyl cutter by first choosing an icon, printing it with the vinyl cutter, and then prepping it before sticking it to a surface. We had a lot of fun with this, and made a variety of stickers from dogs to shrimp, which we used to decorate students’ water bottles as well as the walls. The vinyl cutter is available to use whenever a staff member is there, which is currently on Tuesday, Thursday, and Friday afternoons. If you would like to schedule an appointment to be trained on or use the vinyl cutter, feel free to contact Tori Clayton at vclayton@smith.edu. Another big hit was our gaming laptop connected to the Apple TV. This allowed us to play games that the Women in Gaming group had purchased for the laptop. We played several multiplayer games and one that was single player, but were still able to collaborate by connecting to the large Apple TV screen. The laptop is always available to use during the KnowledgeLab’s open hours, and controllers and headphones are available to check out at the service desk in the hall. 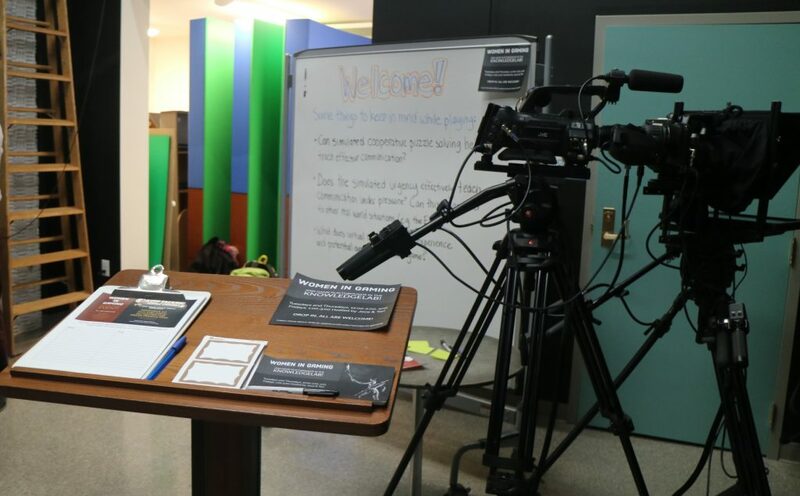 We hope this event demonstrated more possibilities for the KnowledgeLab, and encourage students to continue to use the space to study, create, and play games! One significant cultural change that has come about due to the rise of social media in the past half-decade is the proliferation of “memes.” Although they are totally ubiquitous, they are difficult to pin down with a solid definition; the nature of memes is that they are constantly evolving at speeds only made possible by the internet. Generally, memes are a form of internet humor that involves text juxtaposed with an image, in a way that plays on the emotional resonance of the image and uses it to create new meaning. The governing principle of memes seems to be that they are “relatable”; they are humorous in that they point out a common experience in a poignant and unexpected way. 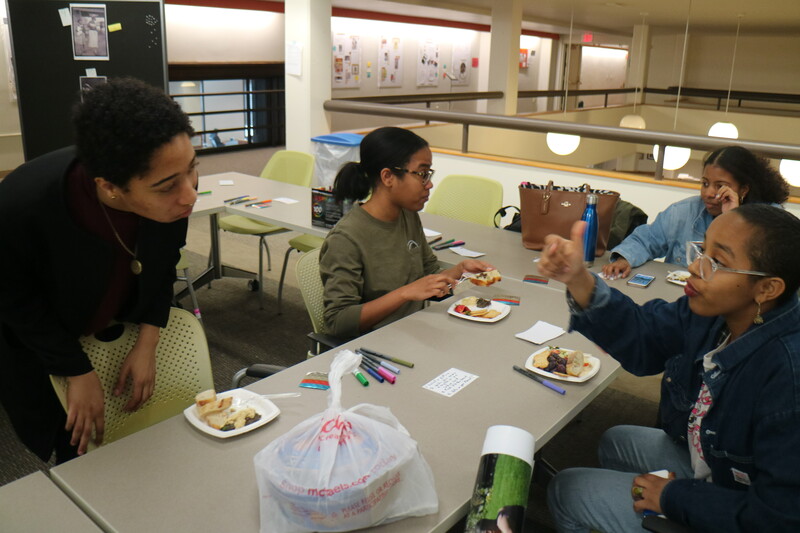 This April, Kayla Foney ’17 organized an event in the KnowledgeLab to explore this peculiar form of cultural production, using a KnowledgeLab $500 mini-grant. 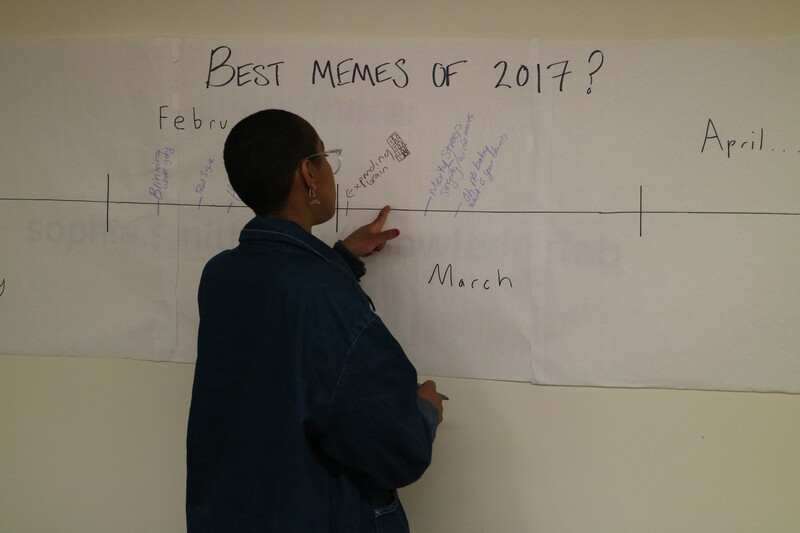 The event sought to investigate what memes really are, how they are situated in a social context, and how they relate gender, race, and nationality. Foney gathered historical photographs that seemed emotionally evocative even without context. Participants generated captions for the images, thus making them into memes. Possible captions were posted under the photos, and participants voted on their favorites. Emotional/Situational: Interpreting facial expressions as frustration, shock, joy, etc. Using that to framing the image into a specific situation, such as taking an Easter photo or seeing an ex. Or, describing facial expressions to identify a meme – blinking, pointing, wide mouth. Referential: Plays on past, concurrent, or future memes: “Name a more dynamic trio,” originates from a Twitter celebrity post and has been a popular phrase online for the past few months. “Supa Hot Fire” references a series of rap cypher parody videos from 2013. “It’s Gonna Be May” as a NSync pun/meme that has popped back up yearly at the end of April/in anticipation of May. Vocal: Making the subject speak on something in the photograph or an invented situation of the creator, like having someone tell you something you already know. Critical: Addressing oppression and power dynamics. Gendered experiences of the 2016 election, respectability politics. Racial microaggressions, disappointment with institutions and how they deal with social issues. Deconstructing systemic power. Contextual: Connections to recent social media and pop culture trends like the Get Out Challenge and the Kendall Jenner Pepsi commercial, references to lyrics and musicians like Kendrick Lamar and Drake. Prominent use of AAVE/slang, like “Whomst”, and references to cultural habits like clapping out the beat when the music stops at a party. Zines are a classic medium of self expression. 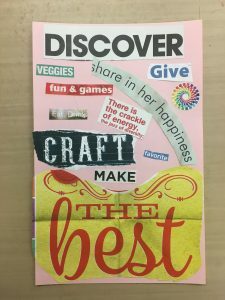 They were perfectly fit for the event we hosted here at the KnowledgeLab last week: the Hampshire County Big Brothers Big Sisters chapter gathered for a creative, collaborative zine-making project. 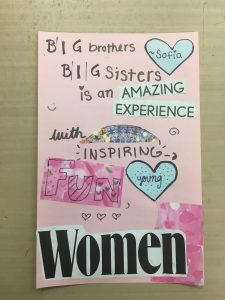 The little siblings, with the help of their Bigs, got the chance to create zine pages using the KnowledgeLab craft resources about a topic meaningful to them. The pages were combined into a large collective zine. 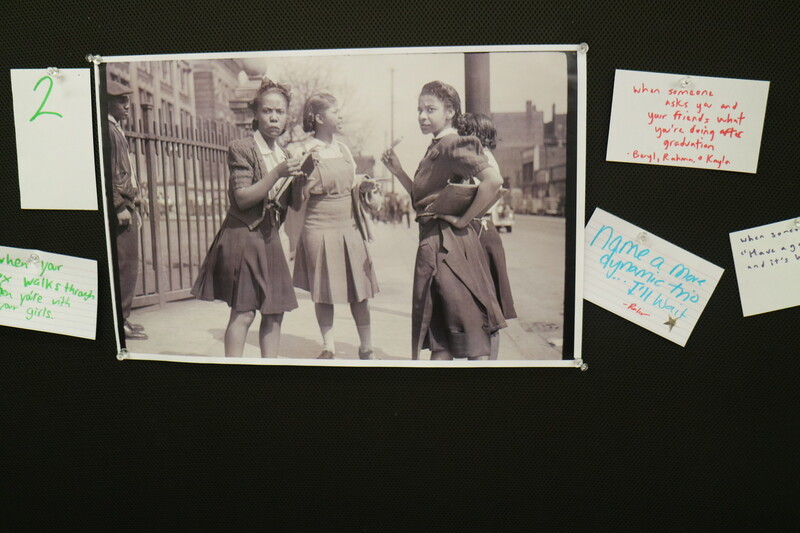 The event was inspired by the zine event Strength for the Struggle, hosted by the library last summer. 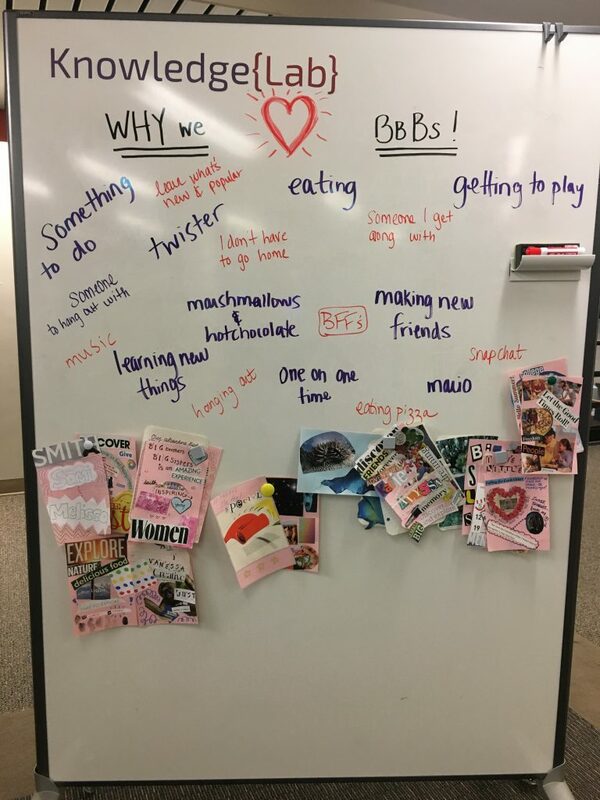 Amanda Ferrara of the library and Jennifer Ablard of the Big Brothers Big Sisters organization conceived of an adaptation of the workshop for 8-13 year olds. The zine will be uploaded to Scholarworks, Smith’s archive of digital scholarship.